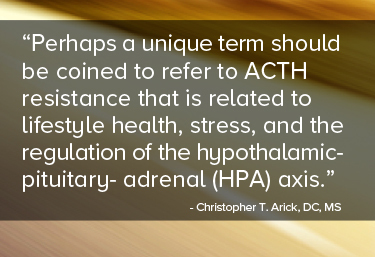 Clinicians may have heard the term ACTH resistance being tossed around clinical seminars and conferences related to adrenal function. These may all be descriptors or variants of ACTH resistance as an aspect of clinical presentation. It is first important to point out that ACTH resistance is also a rare hereditary defect that is usually first detected at birth with symptoms of darkened pigment and feeding problems. These babies are found to have high ACTH levels and low cortisol levels in the blood.1 Perhaps a unique term should be coined to refer to ACTH resistance that is related to lifestyle health, stress, and the regulation of the hypothalamic-pituitary-adrenal (HPA) axis. This is analogous to what happens to insulin. Insulin docks at GLUT4 receptor sites and allows glucose to enter the cell under normal circumstances. Long-term, repeated reliance on endogenous insulin can create a scenario where more of the body’s own insulin is required to stimulate GLUT4 and the cell can become resistant to the effects of insulin over time. This is a spectrum of function. Christopher T. Arick, DC, MS is an assistant professor at National University of Health Sciences-Florida, where he teaches clinical laboratory diagnosis, gastrointestinal/genitourinary evaluation and management, and dermatology. He is director of BioPhysia, a clinical education organization specializing in functional medicine, nutrition, and genomic testing. Dr. Arick is also a PhD candidate at the University of South Florida in Higher Education researching integrative medicine. 1. Huebner, A., L. L. Elias, and A. J. Clark. "ACTH resistance ..." Journal of pediatric endocrinology & metabolism: JPEM 12 (1999): 277-293. 2. Buckley, Theresa M., and Alan F. Schatzberg. "On the interactions of the hypothalamic-pituitary-adrenal (HPA) axis and sleep: normal HPA axis activity and circadian rhythm, exemplary sleep disorders." The Journal of Clinical Endocrinology & Metabolism 90.5 (2005): 3106-3114. 3. Demitrack, Mark A., and Leslie J. Crofford. "Evidence for and pathophysiologic implications of hypothalamic-pituitary-adrenal axis dysregulation ..." Annals of the New York Academy of Sciences 840.1 (1998): 684-697. 4. Silverman, Marni N., and Esther M. Sternberg. "Glucocorticoid regulation of inflammation and its functional correlates: from HPA axis to glucocorticoid receptor dysfunction." Annals of the New York Academy of Sciences 1261.1 (2012): 55-63. 5. Turnbull, Andrew V., and Catherine L. Rivier. "Regulation of the hypothalamic-pituitary-adrenal axis by cytokines: actions and mechanisms of action. "Physiological reviews 79.1 (1999): 1-71. 6. Del Rey, A., and H. O. Besedovsky. "The cytokine-HPA axis circuit contributes to prevent or moderate ..." Zeitschrift für Rheumatologie 59.2 (2000): II31-II35.